Season’s Greetings! Feliz Navidad! Merry Yule! Joyeux Noël! Whatever it is you are celebrating this winter, I’m pretty sure it is an occasion where family and friends and cookies are involved. I love doing traditional Christmas cookies this time of year. I’ve already posted some of my family favorites which I make literally every year, here and here and here. Um, what is there not to love about adorable little holly wreaths laced with marshmallow creme? Or buttery, flakey little cookies sandwiched with a whipped frosting tinted holiday colors? Nothing, that’s what. But, my dear husband requested something “new and interesting”. I promptly informed him I would be making the traditional cookies as I always do, but suggested he pick out a recipe or two from my Martha Stewart Holiday Cookies special issue magazine and I would make it for him. 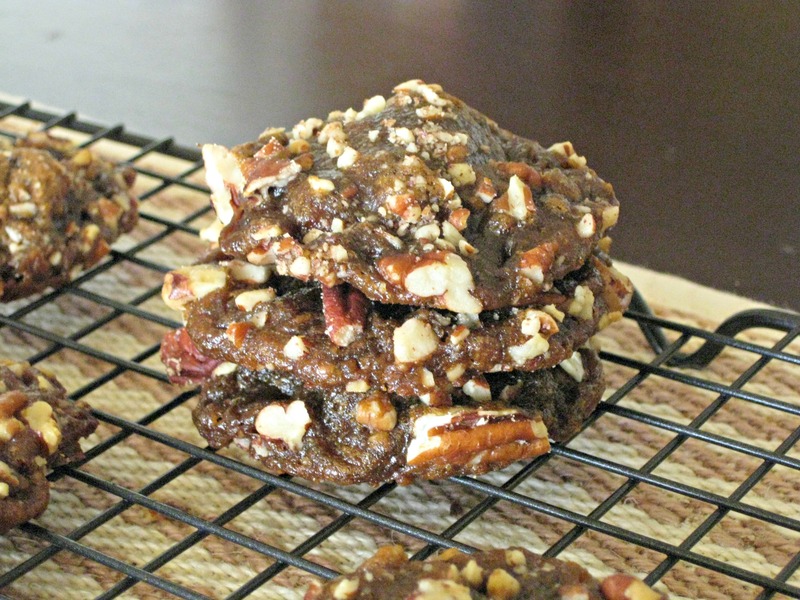 He zeroed in on these delightfully chewy, nutty and very grown-up cookies. These drop cookies come with an extra boost of holiday cheer from a key ingredient– small-batch bourbon. Not only are they yums, but small scale distilleries are all the rage right now (God, is that saying even used anymore? Apparently yes, and by me) so these cookies are a perfect gift for the boozy trendsetter in your life. Next, whisk the brown sugar into the molasses-bourbon mixture and stir until sugar is dissolved. Stir the liquid mixture into the dry ingredients and chill the dough for 1 hour or more. The dough needs to be nicely chilled because it is too soft otherwise which makes rolling the dough into balls difficult. Preheat the oven to 400°. 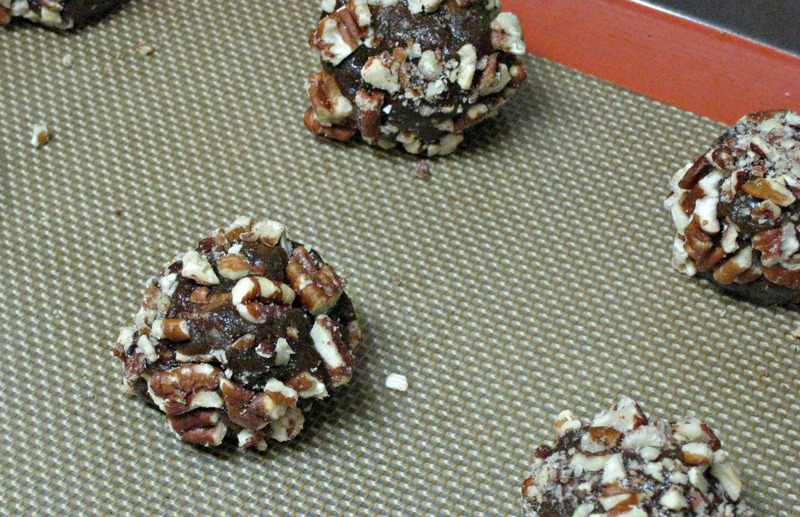 Using a tablespoon size scoop of dough, roll it between your hands to shape a ball, then roll the ball into the remaining 2 cups of chopped pecans. Here is a picture of the pre-baked balls. Place on a baking sheet, allowing a little room between the cookies to spread. Bake for 9 to 11 minutes– cookies are done when the edges are browned and they have flattened out. 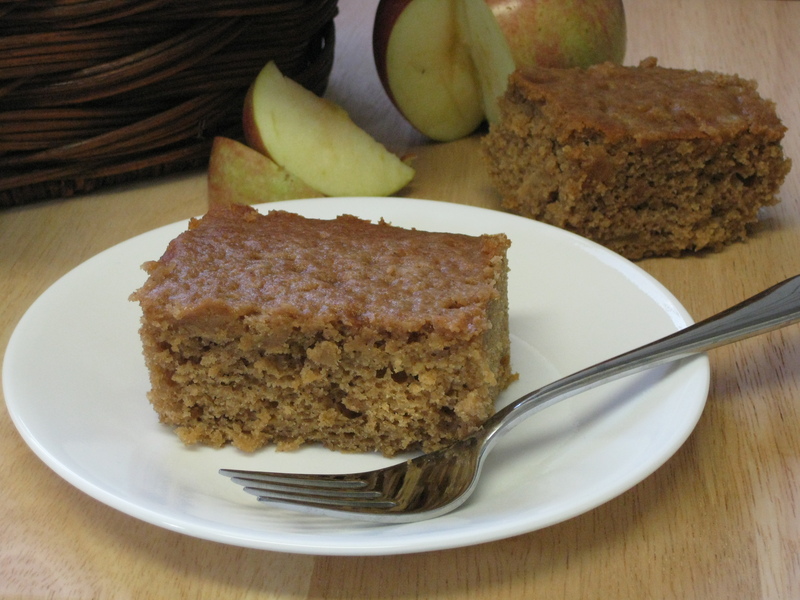 The center may look slightly undone, but it is fine as long as the edges are browned. Remove from oven and let cool for a few minutes on the cookie sheet before removing to a wire rack, as the warm cookies are very floppy. 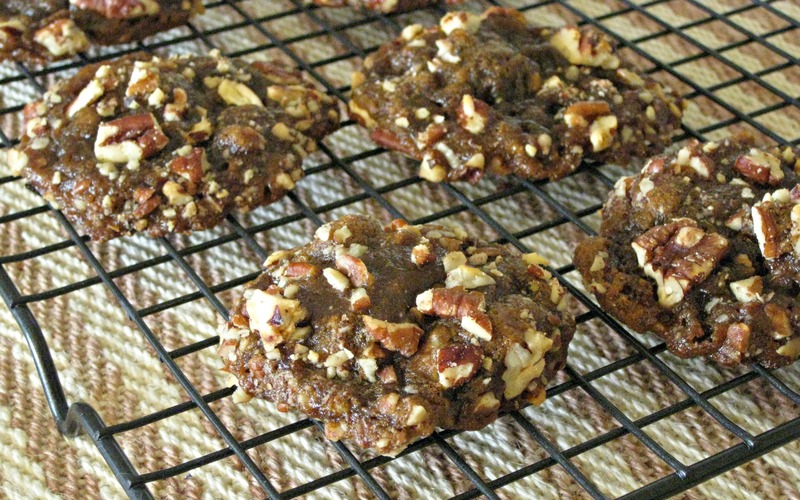 As the cookies cool completely, they will firm up, but still stay deliciously chewy inside. *Note: To toast pecans, spread whole pecans in a single layer onto a cookie sheet and bake in 350° oven for about 10 minutes. Stir occasionally. Once the nuts smell fragrant, take them out of the oven, the oils in the nuts allow them to scorch quickly. Hi readers! Hopefully the title of this post says it all, but yes, the DC State Fair happened this past weekend and my jam won first place, again! 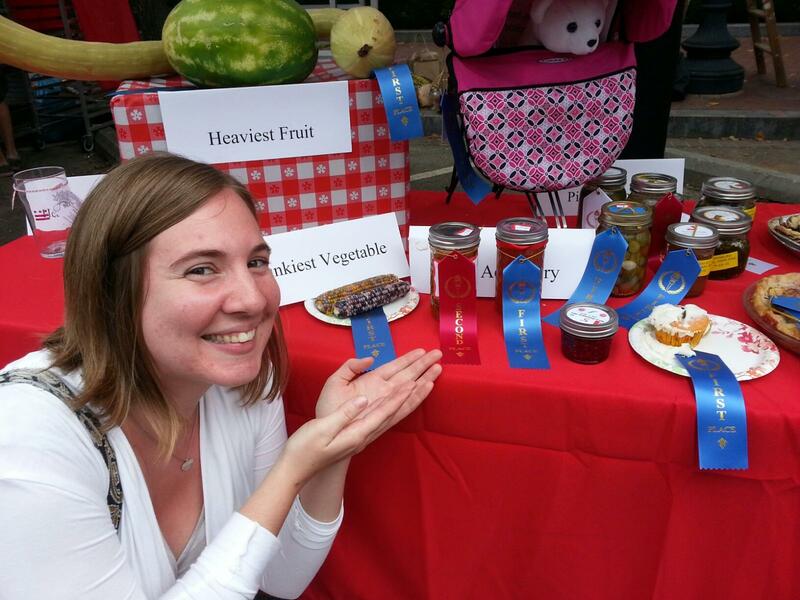 Last year I won first with my Southern Lady Pepper Jelly, and this year I entered two fruit-centric jams. I’m trying to be modest, but both jams placed– 1st and 2nd! So, on the left is the 1st place jam, Smoky Peach and Pepper. 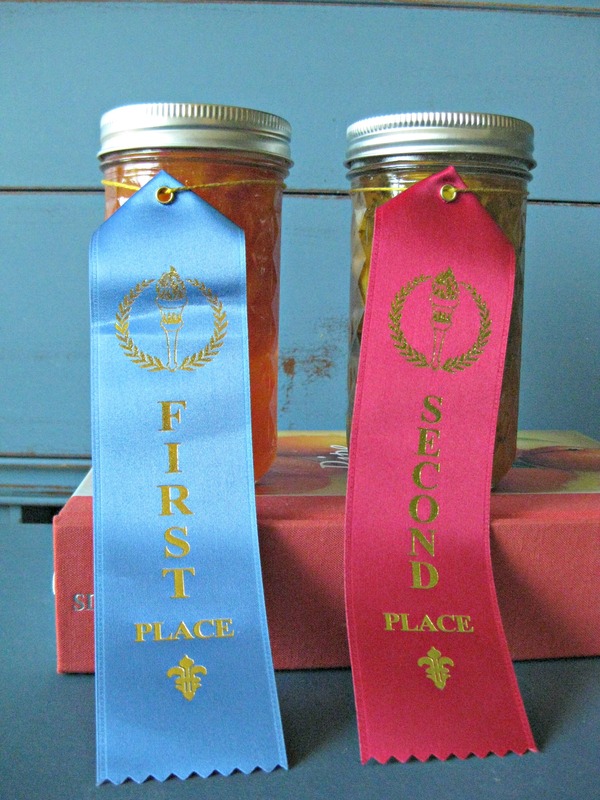 The 2nd place jam on the right is Peach-Basil. These are the peaches my husband and I picked earlier in the summer, and the basil and some of the peppers were grown in my community garden plot. These jams are delicious and too sophisticated in flavor to go on a PB&J. The Smoky Peach and Pepper has an intense smoke flavor that yields to the sweetness of the peach and a tiny hint of heat from the pepper. It is amazing served with cheese and crackers. 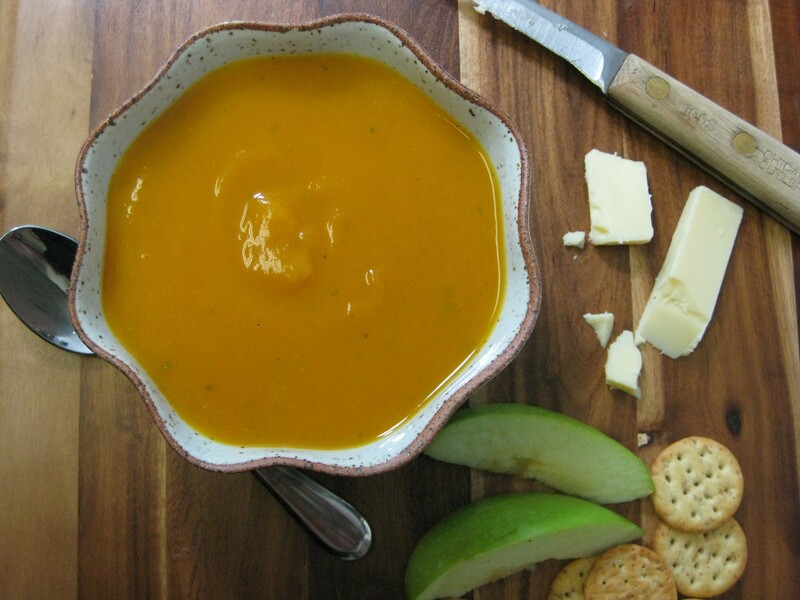 The Peach-Basil is also sweet, with a strong fresh basil taste that intensifies as you chew. I love slathering it onto a toasted bagel and cream cheese. 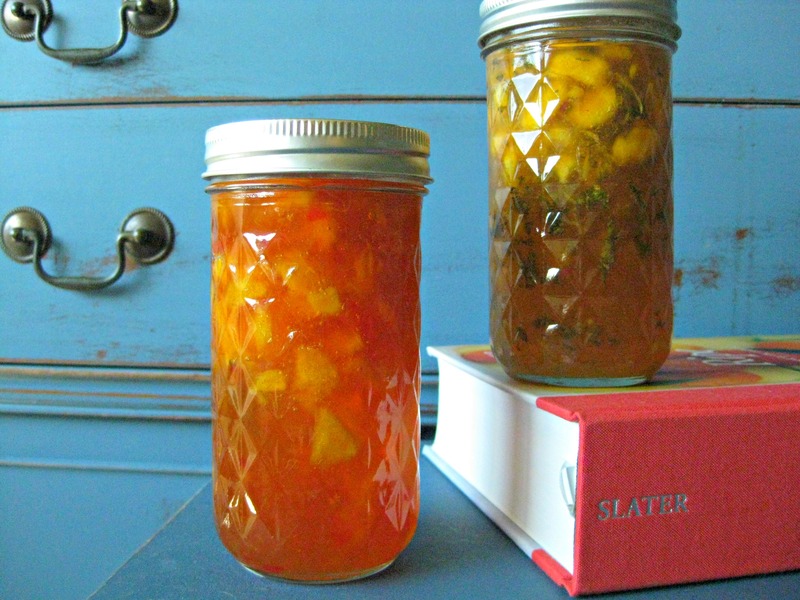 I’m sharing the recipes with you all in the hopes you try these jams too one day. Freshly picked ingredients make the best jam, remember that! I picked everything that went into this jam and then starting cooking it within 24 hours. It sounds like a lot of work, but it really is just fun and you get a better product. Prepare your peaches by scoring an X along the bottom on the skin and dropping the peaches into boiling water for 30 seconds. This will loosen the skin and make it easier to peel. Peel, pit and chop the peaches until you have 4 heaping cups. Add the peaches and lemon juice to a large pot. Stir in the pectin and bring to a boil over high heat. Sit in the sugar all at once. Return to a boil and boil hard for 2 minutes. You will notice the texture of the jam mixture will go from grainy and thick to liquidy. Once it gets liquidy, your almost there but be sure to boil hard for at least two minutes or the jam will be soft. Skim off foam as desired, or plop in a tablespoon of cold butter, which is what I do, to keep the foam down. *If you are making Peach-Basil jam, stir in the snipped basil right after you skim off the foam. 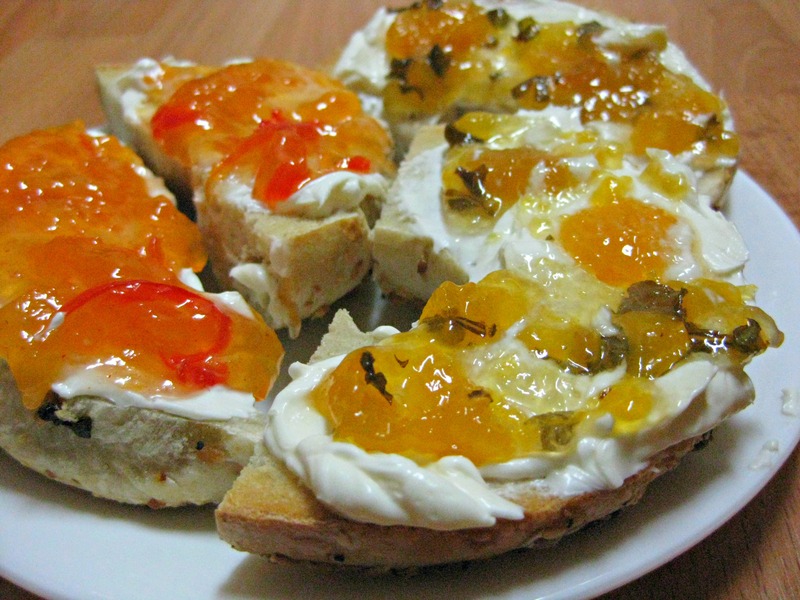 Keep the mixture hot while you are doing this, or else you will get air bubbles in your jam. 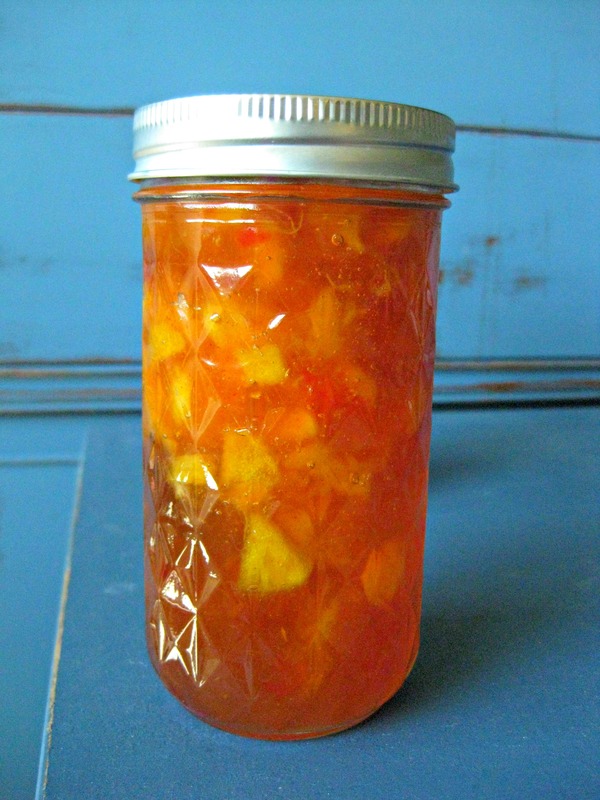 *If you are making Smoky Peach and Pepper, add in the chopped peppers along with the peaches at the beginning of the recipe and continue to cook according to instructions. After you skim the foam or add the butter, stir in the dried ground spices. Again, keep the mixture hot while you are doing this, or else you get air bubbles. Next, ladle the hot jam into cleaned and prepared jars. This should make about 7 eight ounce jars, or the equivalent thereof– I used 12 oz jars because I liked the look. Screw on the lids and the bands, and process in a boiling water canner for 10 minutes. (Start the timer once you’ve put the jars into the canner and the water returns to a full boil). Remove and let cool. 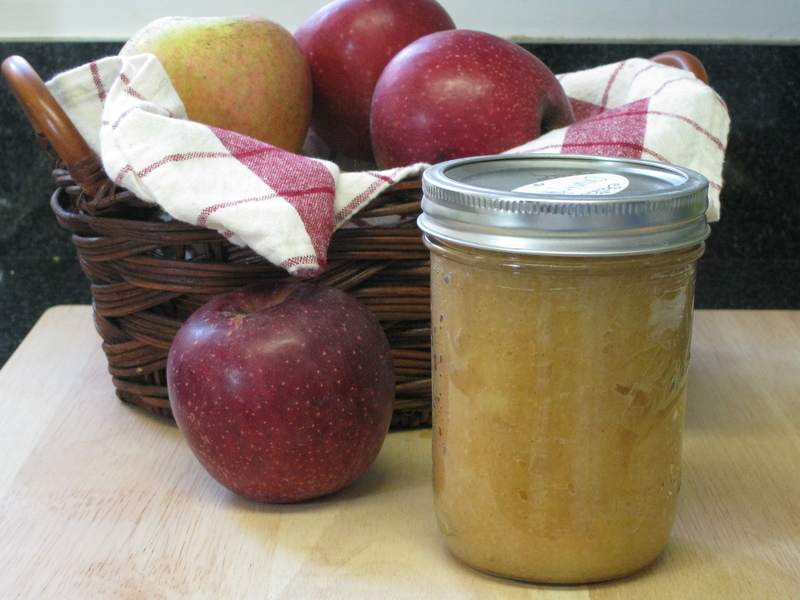 You can turn the jars every few minutes, for the first 20 minutes of cooling, if you want to evenly distribute the fruit. Make sure your lids have sealed and enjoy! The jam is shelf stable for 1 year. Once it has been opened, keep it in the fridge. Anyway, I know you don’t come here for fashion commentary. This post is a round-up of fall recipes I’ve put on the blog before, but deserve to get more attention now that I have (slightly) more readers. You newbies might have missed out on these classics!! For my birthday a couple weekends ago I went apple picking with my in-laws at Stribling Orchard in Virginia. The day was lovely, the apples were plentiful, and the ensuing pie was delicious. I canned four quarts of applesauce, which used up most of the haul, but also made a pie and am working out an apple crumb bar recipe that will hopefully be posted soon! 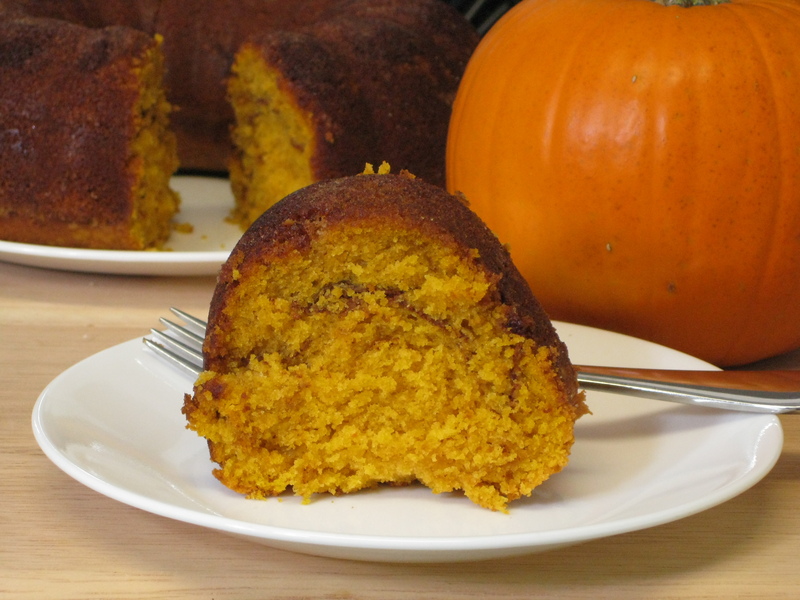 In the meantime, enjoy the tastes of the season with these 5 recipes! You should know what that means by now, right? Get ready for peach posts. 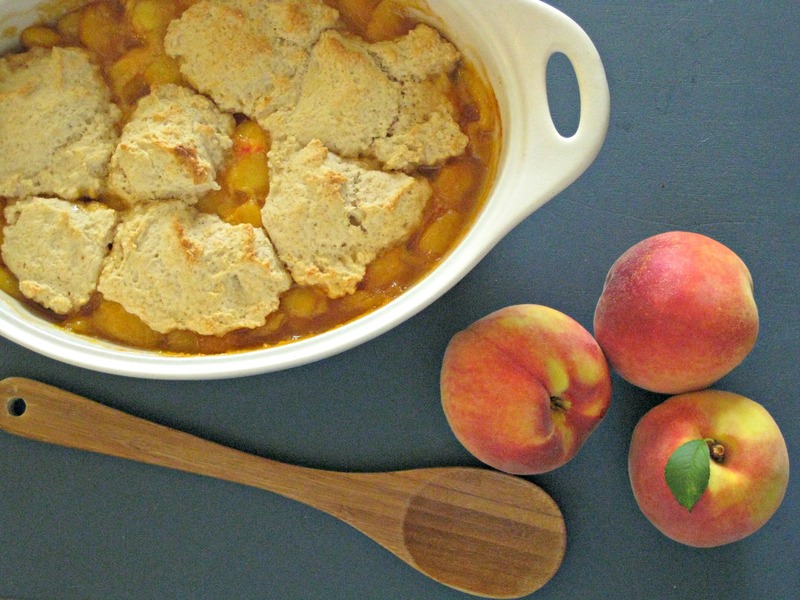 I love this dessert and it is my favorite way to use peaches, even more than pie. No offense to pie. 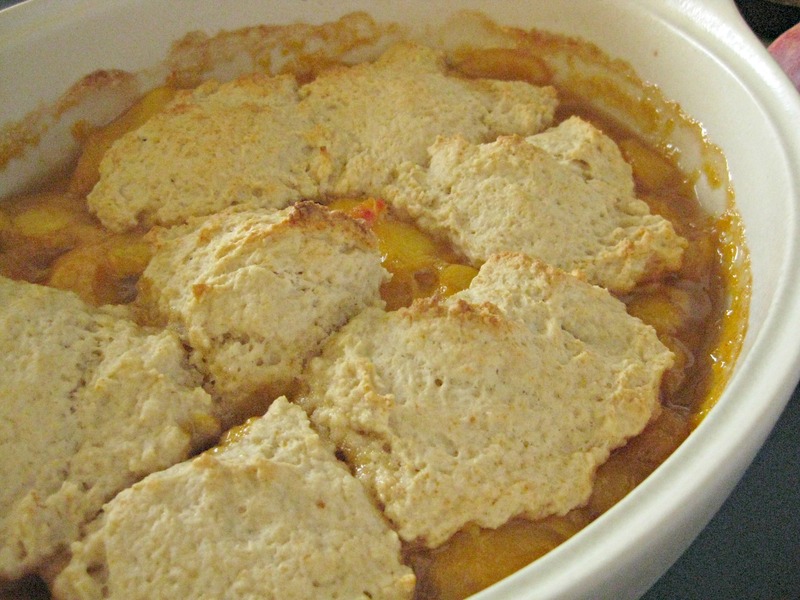 This cobbler showcases the natural sweetness of the peach, which is complimented by the addition of warm cinnamon and almond extract. Go light on the extract, it can be a strong flavor and there is no need to overwhelm the peaches. I know making this dessert requires turning on the oven, which during summer, is counter intuitive. But! It is worth it. The light, spongy dumplings are so yummy, but then when you top it with French vanilla ice cream. Ohhhh my. It is just so creamy and sweet and fresh and fruity and tastes like a party in your mouth. Just try it. It’s simple and worth it! Preheat oven to 400°. Peel and slice your peaches. 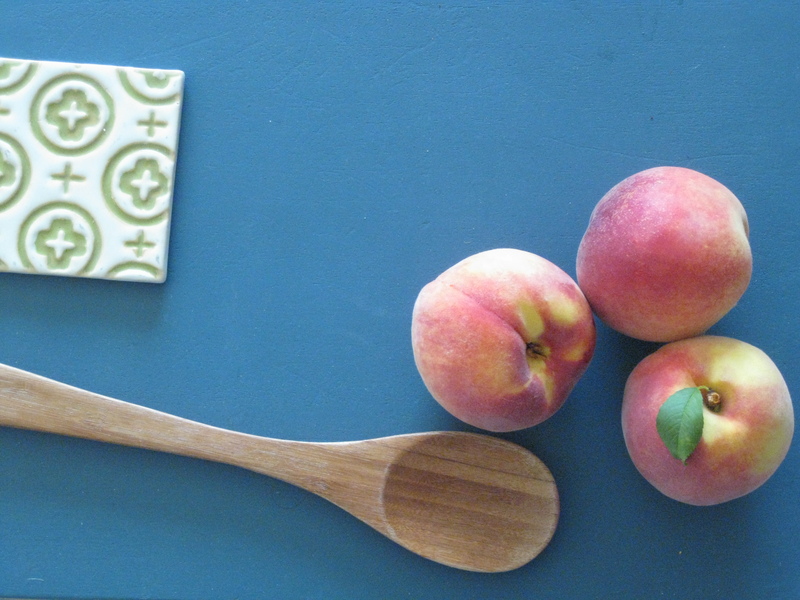 (TIP: Cut an X into each peach, then plunge into boiling water for 60 seconds, this helps the skin slip off). 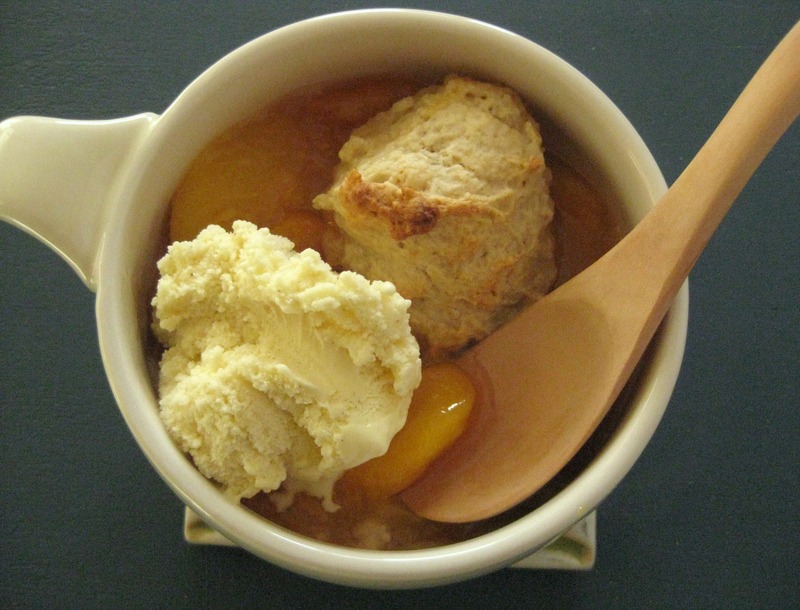 In a large saucepan, combine peaches, 1/2 cup sugar, cinnamon, cornstarch, lime juice and almond extract. Stir until peaches are coated. Cook over medium-high heat, stirring frequently, until boiling, bubbling and thickening, about 5 minutes. Pour into an ungreased 2 qt. baking dish and set in the oven to keep warm while you make the dumpling dough. In a medium bowl, combine the flours, baking powder, salt, and sugar. Cut in the three TBL butter. I slice the three TBL into small pieces, then use my hands to rub the butter into the flour mixture. Do this until it resembles fine crumbs (finer than when making a pie crust). 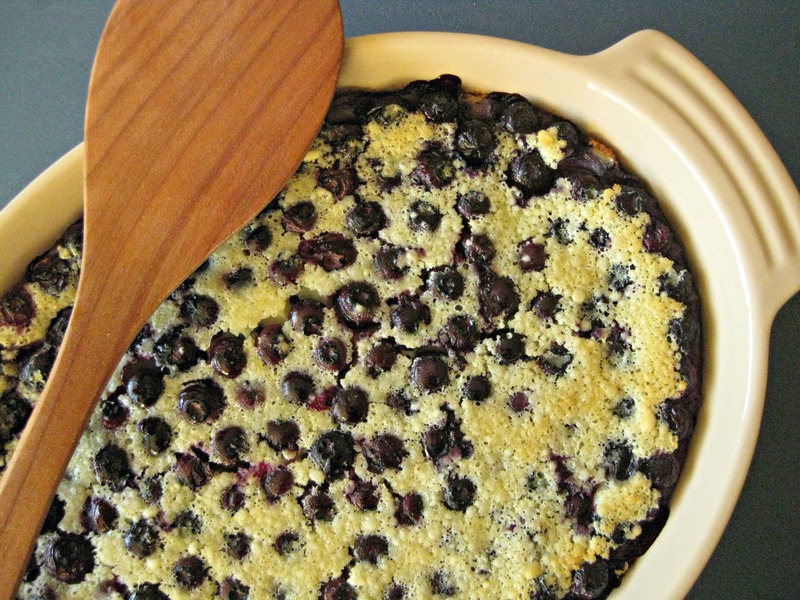 Stir in the milk, then dollop the dough over the cobbler. Bake for 25 to 30 minutes, or until dumplings are golden brown. 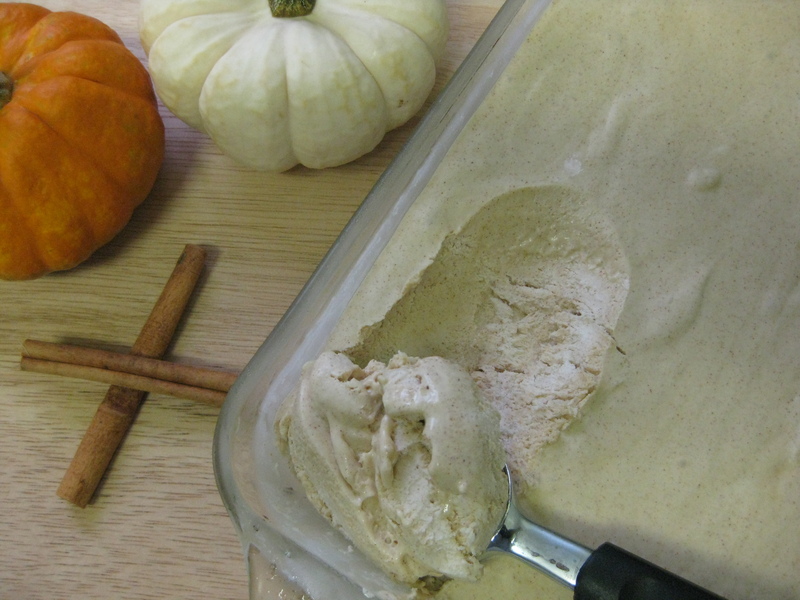 Serve warm, with French vanilla ice cream!! Just cause, isn’t this a pretty picture? Everyone in the area should be loving the DC State Fair- spread the word! Hi dear readers, it’s my last blueberry post. 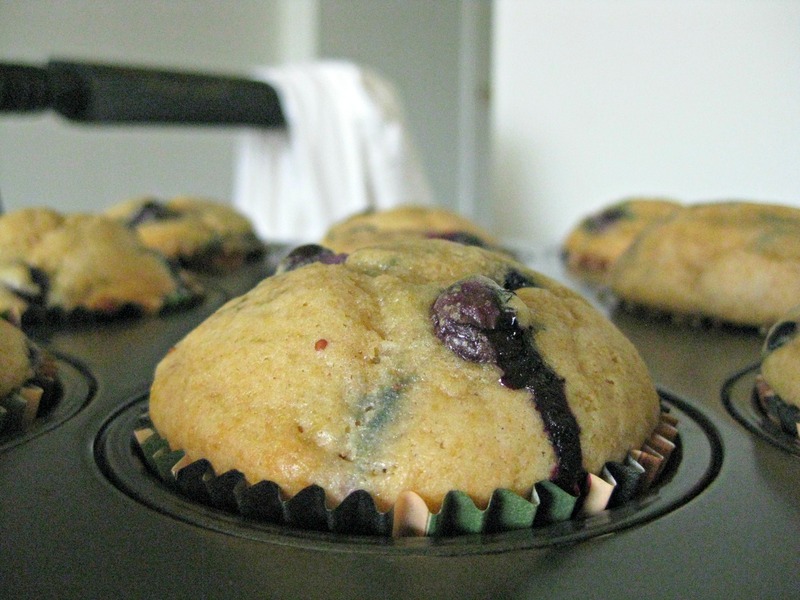 Spiffed-up blueberry muffins! So, what’s spiffed up about them? Well, the addition of whole grain flour of course. Why that? Read on friends. 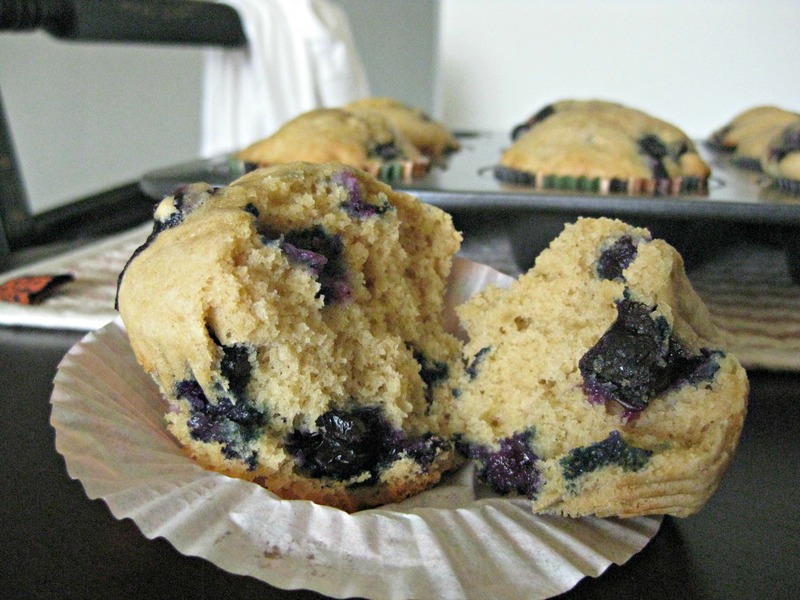 My mom would crank out classic blueberry muffins every summer after we went picking. I always got excited about them, but didn’t love them (sorry mom). I could not put my finger on the exact reason why I didn’t enjoy the muffins as much as I should have until I read a recipe from Nigel Slater. 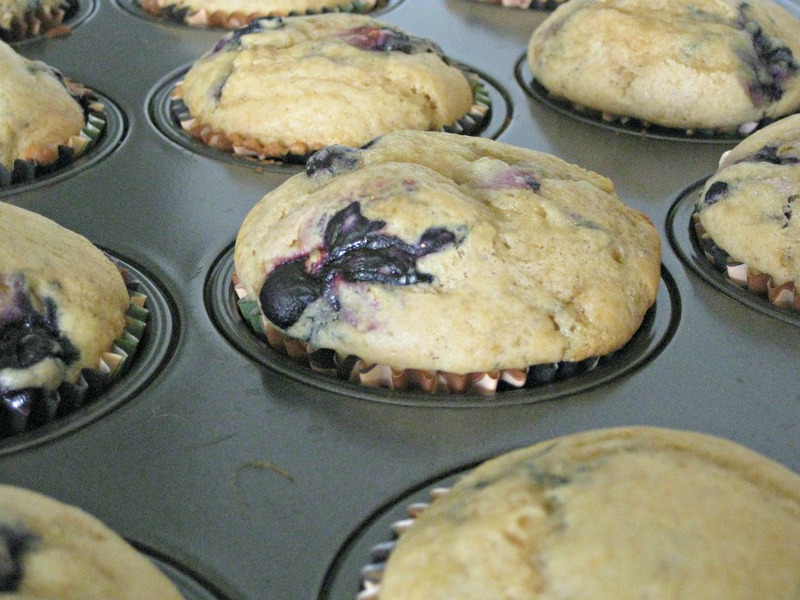 He pointed out that some muffins have a metallic taste which is due to the leavening agent. He recommended spelt flour to get rid of that flavor. I didn’t have any spelt on hand, so I improvised, natch. Whole wheat worked just as well, and yielded delicious, moist and chewy muffins. The whole wheat provides a nutty flavor that masks the leavening but compliments the gentle sweetness of the blueberries. 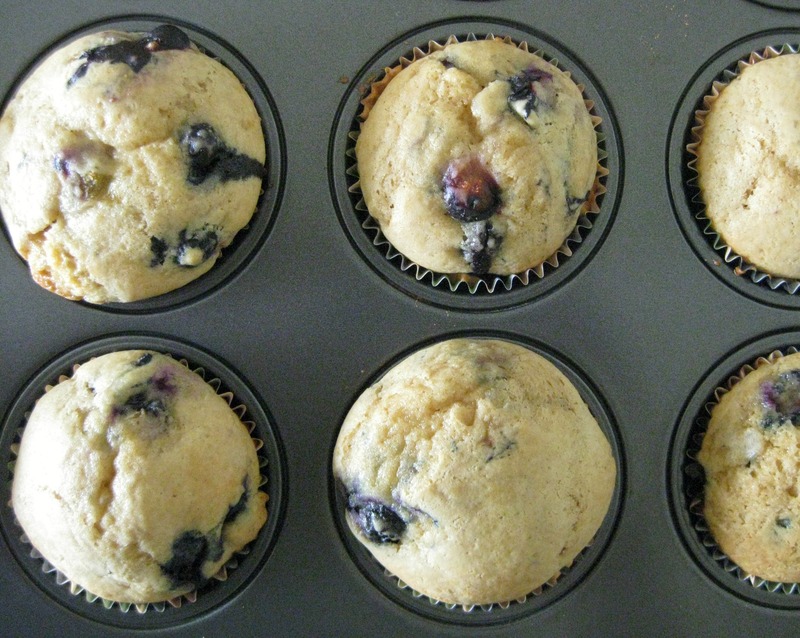 Bake for about 20 minutes, or until skewers come out mostly clean when muffins are pricked. Remove from baking tins and let cool on a rack. Let the blueberry posts continue! Today’s recipe is from a cookbook by Nigel Slater called Ripe. My husband picked this up for me from the gift shop at Gettysburg. I don’t recall the story behind why it was carried in that bookstore, but I imagine it is because many of the recipes are somewhat ‘old timey’ in my opinion (fruit fools, slubs, puddings, old-fashioned cakes). Not to sound like a walking advert for this cookbook, but I really enjoy it. There are some nice pictures which are mouthwatering to look at and there is a great array of recipes that are just fun to read. Yes, I’m a bit nerdy, and will read a cookbook like a novel. The book is organized according to chapters by “fruit”. So, if you have a load of blueberries like I did, you can read the blueberry chapter and there is plenty of inspiration right there in one spot. Alright, enough on that. Let’s move onto the pudding! This is not a Jell-O style pudding, it is a baked British pudding. 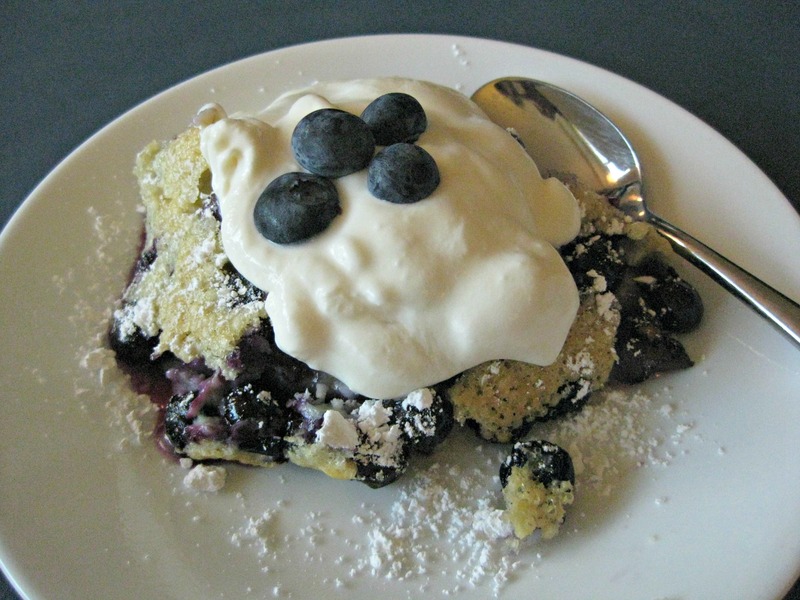 Once you’ve whipped up the incredibly easy batter, pour it over the blueberries, and they float to the top of the dish and help form the delicate golden crust you see. Hiding just underneath is a warm, quivering custard pudding. 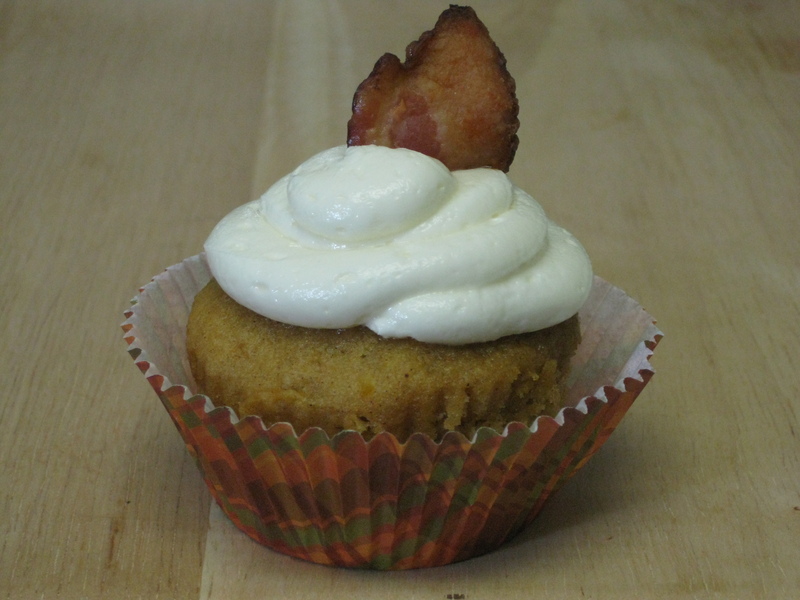 I really loved this dessert, topped with some lightly sweetened and barely whipped cream. (I mean barely holding its shape so it gets a bit melty when it hits the warm pudding). Please, try it for yourself. I bet peaches would be lovely with it too. Preheat oven to 400°. Grease an ovenproof 2 quart dish (about 10 in in diameter) with butter or shortening. Pulse the eggs, flour, sugar, cream and milk together in a food processor. 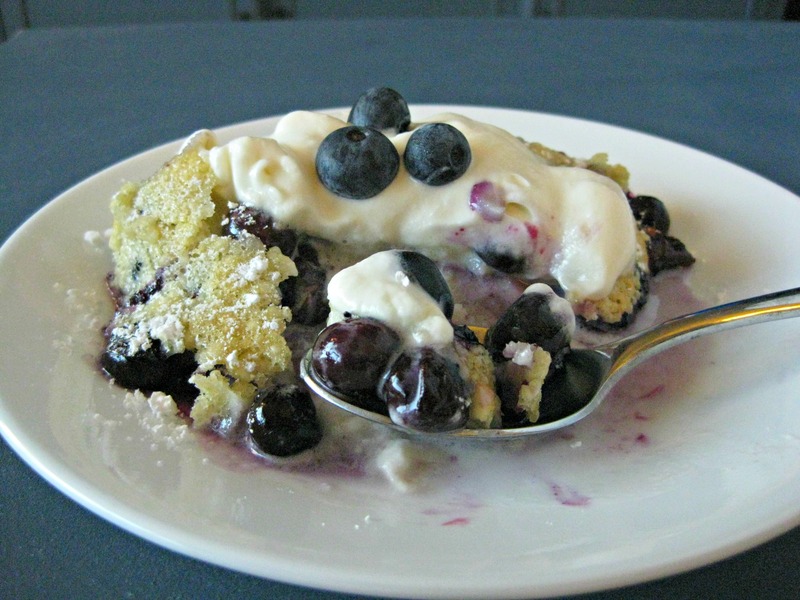 Pour the blueberries into the greased dish, then pour the whipped batter over the berries. Bake for about 40 minutes or until batter is golden, lightly risen and just barely set (firm to the touch, but a bit wobbly). Remove from oven and let cool slightly. Whip your cream, dust with confectioners sugar and serve warm. *Note: I tweaked this slightly from Nigel’s recipe, this isn’t an exact reprint.